Pharmaceutical packaging must balance a myriad of complex considerations. Besides the usual requirements that apply to any consumer product, pharmaceutical packagers must comply with very specific legal and safety regulations. In addition to simple issues such as the development of effective designs and the ability to communicate with consumers, pharmaceutical packaging companies must respond to critical concerns, such as fighting counterfeits, ensuring drug integrity, balancing child-resistance and elderly accessibility, and responding to market trends that include sustainability, smart packaging, and customization. Faced with such a varied host of challenges, pharmaceutical packaging firms must continuously resort to innovation. This article will discuss how federal R&D tax credits can help these companies succeed in a highly dynamic and increasingly competitive market. The packaging industry plays a unique and strategic role in the healthcare market. Not only is it responsible for providing life-saving drugs, medical devices, and medical treatments but it must also ensure safety, identity, convenience of handling, and proper delivery. According to research firm Transparency Market Research, the global pharmaceutical packaging market is expected to grow at a CAGR of 5.6 percent from 2012 to 2018, eventually attaining an overall market value of $73.04 billion in 2018. Containment The containment of the product is the most fundamental function of packaging. The design of high-quality packaging must take into account both the needs of the product and of the manufacturing and distribution system. This requires the packaging: not to leak, nor allow diffusion and permeation of the product, to be strong enough to hold the contents when subjected to normal handling and not to be altered by the ingredients of the formulation in its final dosage form. Protection The packaging must protect the product against all adverse external influences that may affect its quality or potency, such as light, moisture, oxygen, biological contamination, mechanical damage and counterfeiting/adulteration. Presentation & Information Packaging is also an essential source of information on medicinal products. Such information is provided by labels and package inserts for patients. Identification The printed packs or its ancillary printed components serves the functions of providing both identity and information. Convenience The convenience is associated with product use or administration e.g., a unit dose eye drop which both eliminates the need for preservative and reduces risks associated with cross infection, by administering only a single dose. A recent report by Transparency Market Research predicts that the global pharmaceutical packaging market will grow at a compound annual growth rate of 5.6 percent between 2012 and 2018, eventually attaining an overall market value of $73.04 billion in 2018. Despite favorable prospects driven by the expansion of generics and a growing demand for customized treatments, pharmaceutical packagers must face various challenges, which include addressing product requirements while ensuring that customer, marketing, retailer, and supply chain needs are satisfied. The following sections present an overview of recent trends for pharmaceutical packaging and the strategic role of innovation in this ever-evolving market. The use of innovative packaging materials can greatly contribute to extending the lifecycle of pharmaceutical products. Packaging integrity, for instance, is crucial to maintaining a drug product’s quality throughout its shelf life. Major challenges include the protection against moisture, light, oxygen, and mechanical forces. Nano-enabled packaging is an important area for innovation. When incorporated in the development of pharmaceutical packaging, nanotechnology applications can enhance plastic materials' barriers, enable active components to deliver functional attributes beyond those of traditional active packaging, and help implement sensing and signaling of relevant information. Nanotechnology can make objects and films lighter, stronger in terms of mechanical and thermal performance, and less permeable to gases. In the context of packaging solutions, nano-enabled materials can enhance drug safety by controlling microbial growth and delaying oxidation as well as improving tamper visibility and anti-counterfeiting. Using nanotechnology, Singapore-based Tera-Barrier Films (TBF) has developed a new plastic film that is thinner than aluminum foil but as effective as an air and moister barrier. The innovative material features an encapsulated nanoparticle layer, thinner than a human hair, that actively absorbs and reacts with water and oxygen molecules to trap them and avoid permeation. It offers both transparency and stretchability, a combination not possible with aluminum-based packaging materials. By bridging the gap between aluminum foil and transparent oxide films, TBF expects to pioneer a new generation of packaging materials that can prolong the shelf-life of pharmaceuticals. In addition to new materials, innovative processes are also crucial for the pharmaceutical packaging industry. One example is the blow-fill-seal (BFS) technology, a process in which plastic containers are formed, filled, and sealed in a continuous process within a sterile enclosed area inside a machine, with no human intervention. Combining flexibility in packaging design, low operating costs, and a high degree of sterility, this superior form of aseptic processing offers considerable advantages over conventional aseptic filling or preformed containers. It is particularly suited for biologics, proteins, and other complex solutions that cannot be exposed to high temperatures and, therefore, cannot undergo conventional terminal sterilization. Headquartered in Somerset, New Jersey, Catalent Pharma Solutions has developed the ADVASEPT technology, an advanced aseptic filling solution for biologics, parenteral, respiratory, and other products. The innovative, glass-free vial design leverages automation and engineering controls to optimize the BFS process. Within just 15 seconds, containers are formed, filled, and sealed in ISO 5 aseptic conditions. The issue of temperature-sensitive drugs also calls for innovative materials and processes, not only in primary packaging, but throughout the supply chain. Fluctuations in temperature can directly affect a product’s stability and its therapeutic effectiveness. According to the 2014 Global Cold Chain Report, more than 50 percent of the world’s best-selling drugs will require cold chain protection by 2016. Driving forces include the expanding number of biologics, more attention to controlled-room-temperature distribution, and rapidly growing drug sales in emerging markets. The Global Healthcare Cold Chain Logistics Market Report & Forecast (2013-2018) by the IMARC Group, predicts an increase in the market value of cold chain logistics from $7.3 billion in 2013 to $11.4 billion by 2018. Manufacturer of labeling and packaging solutions, Avery Dennison has created a variety of products for the pharmaceutical market. The company offers cryogenic labels capable of withstanding temperatures of -196°C to +90°C, and performing in conditions of dry ice, steam autoclave, and gamma radiation. In addition to sustaining the flexibility and adherence required when using liquid nitrogen during the cryogenic process, the labels are resistant to chemicals commonly found in clinical environments, including Xylene, Isopropanol, Dimethyl Sulfoxide, and 10% Hydrochloric Acid. A recent article by the Pharmaceutical Technology Magazine points out to the expected trends in temperature-controlled logistics, namely, the growth of pre-qualified shippers, more sophisticated supply chain services, rising interest in reusable packaging, and advances in temperature-monitoring technology. Nanotechnology, blow-fill-seal, and cold chain logistics are just a few aspects that drive materials and processes innovation for pharmaceutical packaging. Companies investing in these and other innovative technologies should take advantage of federal R&D tax credits. The design of pharmaceutical packaging systems must overcome significant challenges. Balancing child-resistance and accessibility for the elderly is one of them. Simply put, a package must prevent the accidental access and poisoning of children while making sure that adults, including seniors, can easily open and close it. Innovative design is key to finding this delicate balance. An interesting example comes from Australian-based multinational packaging company Amcor, which recently introduced its patented Amcor Opening Feature (AOF) for child-resistant blister lidding. With AOF, blister contents are easily accessed with a targeted push-through motion rather than the traditional peel or peel-push method often required for child resistance. In addition to enhancing both senior friendliness and child resistance, the innovative solution is also a more sustainable alternative to conventional ones. AOF Blister Lidding allows the use of a two-ply structure compared to a standard three-ply structure. Because peel tabs are not required, total package size can be reduced up to 40 percent. Responding to new regulation that requires child-resistant packaging for any over-the-counter or prescription products containing imidazolines equivalent to 0.08 milligrams or more, Buena, New Jersey-based Comar LLC launched the SecureCap closures. Specially designed to safely package and dispense eye drops and nasal sprays, the solution consists of a two-piece push-and-turn proprietary technology that combines effective child-resistant and senior-friendly performance. Keeping in mind that a successful solution should also be easy to implement, SecureCap closures were carefully designed to accommodate industry-standard finishes on plastic dropper bottles and metered dose sprayers. They can be used with existing materials and applied with existing capping equipment on most filling lines, saving manufacturers’ time and money. In addition to major design challenges, new market trends should also guide pharmaceutical packaging innovation priorities. An important example is the emergence of customized treatments, focused on user-centered drug delivery. The consolidation of a personalized approach to medicine, embodied by President Obama’s Precision Medicine Initiative , opens the way for a transition in the pharmaceutical industry, from supply-driven to demand-driven. This scenario should bring two major consequences. First, it should generate a surge in alternative drug delivery methods, including injectable, transdermal, pulmonary, and nasal. According to a recent analysis from Frost & Sullivan, while demand for tablets and capsules will remain important, the use of pre-filled syringes and inhalers will surge, due to their ease of use and improved customization. Second, by advocating the spread of tailor-made treatments, the personalized medicine approach should encourage a customization of packaging, specially designed to target specific individuals or groups. Pharmaceutical packagers must invest in new technologies that enable the sort of just-in-time manufacturing that a demand-driven industry requires. Additionally, they must pay increasing attention to user interface. In this context, some believe that the use of cutting-edge technology, such as 3D printing, is not as farfetched as it may sound. According to Peter J. Schmitt, Managing Director at Montesino, we can envision walking into a pharmacy and having a 3D printer (or similar device) produce a completely customized package in a not too distant future. Besides responding to a growing demand for customized treatments, packaging companies must keep up with another important pharmaceutical trend, namely, the multiplication of combination products. The same report estimates that the global drug-device combination products market will grow at 7.9 percent CAGR between 2013 and 2019. Driven by factors such as the rising incidence of cardiovascular diseases, pain causing anomalies, colorectal cancer, diabetic retinopathy, asthma, prostate cancer, obesity, and a rapidly growing geriatric population, combination products are expected to have major impact on the overall healthcare market. Combination products such as insulin injector pens, metered-dose inhalers, transdermal patches, and pre-filled syringes add convenience and save users’ time and effort. According to Michigan State University Ph.D. and assistant professor Laura Bix, however, such products add significant complexity to the packaging system. In some cases, the device itself becomes the primary package for the drug product. Device manufacturers must then consider a host of factors, such shelf life efficacy, moister permeation, and drug stability. Also, packages for combination products must be able to maintain a sterile environment for the drug-device combination. Designers have to make sure that all materials are compatible with the sterilization process, so that they are not adversely affected by it. They must also consider the package’s geometry and size, which can affect the sterilization process. Pharmaceutical packaging must respond to a variety of complex demands, among which is a growing concern about its environmental footprint. Responsible sourcing, resource optimization and waste reduction, water conservation, energy efficiency and the use of renewable energy, along with reduced greenhouse gas emissions and pollution, are examples of new inescapable priorities. The upstanding challenge is to meet such priorities while maintaining a package’s safety and accessibility. Innovation in eco-design can help companies enhance their sustainable practices while increasing profitability. Based in Newark, New Jersey, Keystone Folding Box Company is the creator of award-winning sustainable compliance packaging Ecoslide-RX. The child, resistant, senior-friendly package is made from a hundred percent recyclable material; it contains no plastic in its secondary packaging and, unlike other paperboard compliance packs, requires minimal film and foil. The solution is suited for prescription products, physician’s samples, and clinical trial materials. It is also more affordable than most blister packages and can be efficiently produced via high-speed automation lines. Adopted by an increasing number of organizations, Ecoslide-RX was initially introduced at Wal-Mart pharmacies in 2012. On January 6th, 2015, the retailer announced the incorporation of the new Ecoslide-RX 2.0, with a host of upgraded features. Many pharmaceutical and medical device companies are committing to sustainable practices and expect their packaging partners to do so as well. With operational headquarters in suburban Minneapolis, Minnesota, medical technology and services company Medtronic has set goals to reduce packaging size and weight, reduce packaging toxicity, replace paper manuals with electronic manuals or compact disks, reduce packaging waste in landfills, and promote recycling. The company’s design teams developed packaging that no longer contains PVC and uses much less material, while still meeting all international codes for sterile medical equipment. The environmental benefits resulting from Medtronic’s efforts include an annual reduction of over 500,000 pounds of packaging waste and paper, and another potential 190,000 pounds if packages are reused. The company has realized over $2.3 million in cost savings in a two-year period. British multinational pharmaceutical company GlaxoSmithKline has also employed a variety of packaging sustainability solutions, from reducing carton board thickness and using less ink, to introducing “zero waste-to-landfill” programs at its manufacturing sites. Clinton, Tennessee-based Pharma Packaging Solutions has advocated source reduction substrate options, leading a number of international brands from three-ply corrugated materials to strong, single-sheet, direct print substrates. This simple switch can go a long way in meeting a company’s sustainable and economic needs. Sustainable packaging efforts can reflect on a company’s profitability, by reducing overall production, shipping, and warehouse costs. Moreover, such efforts can directly affect a company’s ability to do business. An increasing number of customers in the healthcare market are implementing Wal-Mart-like sustainability programs. Sixty-year-old healthcare provider, Kaiser Permenante, for instance, has been a pioneer in using scorecards to evaluate the environmental footprint of its partners. The pharmaceutical industry must be ready to respond to a growing concern with packaging sustainability. Innovative efforts to reduce the environmental footprint of packages can positively influence the bottom-line, even more so when supported by federal R&D tax credits. The Centers for Disease Control and Prevention (CDC) defines medication adherence as “the patient’s conformance with the provider’s recommendation with respect to timing, dosage, and frequency of medication-taking during the prescribed length of time”. The organization estimates that 20 to 30 percent of drug prescriptions are never filled, while medication is not continued as prescribed in nearly half of the cases. Non-adherence causes 30 to 50 percent of treatment failures and 125,000 deaths annually, resulting in an economic burden of $100 to $289 billion per year. Pharmaceutical packaging innovation can greatly contribute to fostering adherent behaviors. Effective packaging solutions must be able to communicate with users, driving patient compliance and reducing errors. This is increasingly made possible by the incorporation of innovative technologies that remind patients to take their medications and even allow doctors to remotely monitor the use of prescribed drugs. The so-called “smart” packs, for instance, carry a microchip capable of capturing use-related data. The devices register when a medicine is taken; remind when the next dose is due (they do so by bleeping at prearranged times); provide features, such as the expiration date, storage conditions, and tamper alerts; and even record responses to simple monitoring questions (e.g. “is your blood sugar normal?”). Collected data is then downloaded into reading software and used to build a record of individual adherence. Using Near Field Communication , RFID , Bluetooth, or even cellular networks, smart packages can easily establish communication with a variety of gadgets. A number of electronic adherence monitoring solutions are being developed. Headquartered in Richmond, Virginia, global packaging company MWV has used cutting-edge technology to create the Cerepak Smart Adherence Packaging. 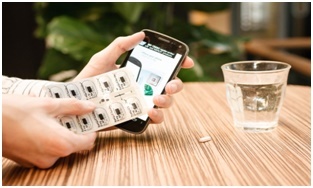 Targeted at the clinical trials market, the innovative package contains a tiny, hidden microprocessor and printed, conductive inks that record the date, time, and location of each pill removed from it. Cerepak tracks the removal of each specific tablet, which is critical for dose titration (pill dosage changes) and for regimens with a mix of placebo and active drugs. Additional features include “prompt” technology that uses light and vibration to help patients remember to take medication and optional one-push-button questionnaires to record Quality of Life (QOL) feedback (pain, insomnia, thirst) at each dosing event. The company offers a complete software platform for the uploading of information. Using Near Field Technology, both dosing and questionnaire data are immediately sent for analysis. Even though the core technology already exists, further research and development efforts are necessary to lower manufacturing costs and enable large-scale adoption of smart packages. In addition to the unit costs of production, the implementation of back-end systems, and the need for regulatory approval are also a barrier. The creation of standardized datasets that enable an interface between medical devices and electronic prescribing systems is also a necessary step for widespread implementation. A world standard for electronic adherence data collection is crucial, as it will allow manufacturers to compete with each other on features and not on technical standards. A global data standard will enable the pre-programming of smart packs based on the medicines they carry. One can also envision pharmacies performing in loco programming, based on specific monitoring requirements or agreements with health commissioners. eHealth initiatives for medication adherence should become a major part of the pharmaceutical future. In this scenario, the development of smart packages is an important step that could give companies invaluable comparative advantages. R&D tax credits could be a strategic tool in supporting smart packaging pioneers. From emerging sustainability requirements and new customization demands to the implementation of smart packaging and the rise of combination products, pharmaceutical packaging companies must respond to a host of complex market trends. Federal and state R&D tax credits can help pave the way to the future of pharmaceutical packaging.